Barton Taken from the Old English words 'bere' & 't?n' meaning 'barley town' with the village being mentioned in the Domesday Book as 'Bartun'. Barton is a small village on the main A6 road situated approx. 5.5 miles from Preston. At the end of a tree lined avenue sits the lovely church of St. Laurence, which incorporates a memorial to the 14/20th King's Hussars, and was erected in 1905, paid for by William Smith of Newsham House. This church replaced an earlier church dedicated to St. Mary which was erected in 1806. The Roman Catholic Church of St. Mary Newhouse erected in 1863 replaced an earlier Newsham Chapel which was erected by Father Roger Brockholes of Claughton in 1741-2. Bartle The name Bartle is thought to have derived from the Old English words 'bere' & 't?gl' meaning 'a tongue of land on which barley grows' although some say it could derive from the Old English word 'bar' which would transcribe to' a tongue of land were boars roam' this second suggestion is based on the theory that this once being a heavily wooded area there would have been a plentiful supply of boars. Bartle is probably best known for Bartle Hall originally known as Leach Hall. Broughton The first recorded use this name was in the Domesday Book when the village was known as 'Brocton' and later in 1303 was recorded as 'Broghton' The name is believed to be Old English in origin from the words 'br?c' and 't?n' meaning 'Town by a stream'. 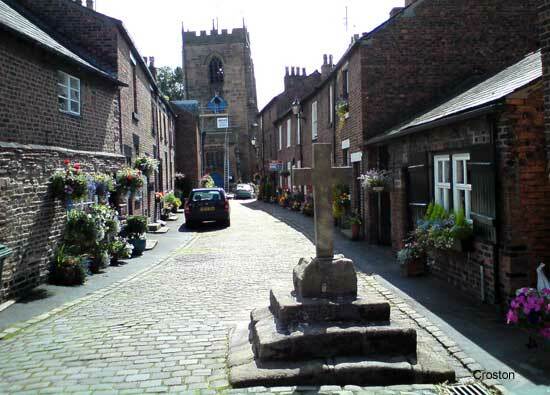 Dr. Whitaker believed that Broughton obtained its name from from a small Roman fort, sitting as it does on the line of the old Roman Road from Manchester to Lancaster. Traces of the first settlement can be found by the Blundel Brook. ?Because of its proximity to Preston, the village of Broughton is sought out by commuters, however there are still cottages and houses from the time when it was a rural village community.? Catforth Catforth is partly in the parish of Woodplumpton and partly in that of Inskip, and lies between these villages, some five miles from Preston. The ground was once marshy so that drainage and infilling was necessary. The inn called The Running Pump and the house known as Spring Cottage bear witness to the presence of natural springs. Spring Cottage is thought to have been the brewhouse of the inn. The agricultural past and present of the village is marked by the old smithy and the tithe barn (now a private house) and the number of working farms. Cottages once inhabited by handloom weavers and the name of Tan Pit Farm refer to former occupations in addition to farming; so does the malt house shown on the 1840s Ordnance Survey map as being on the canal bank. Cottam Cottam derives from the Old English words 'cot' & 'um' meaning 'the cottages', the first recorded use of the name was in 1230 when it was described as 'Cotun' but by 1235 had become 'Cotum' much as it is pronounced today. Kuerden tells us of an undated deed where; "Geoffrey de Cottam, acknowledges that he hold some land belonging to Henry de Hydok, by an annual rent of 15d and a half pound of cumins." Baines says in 'The History of Lancashire' 1868 that of the aforementioned family of Henry de Hydok; "were probably Edmund de Haydocke, who according to a survey in 1320-1346, held part of one carucate of land in socage (a feudal tenancy) in the manor of Ashton, and Elianora, a widow of Richard de Haydoke, who held lands in Ingol, Cottam and Ashton in the 16th year of the reign of Henry the VIII. George Leop Haydock, a very learned Roman Catholic priest, who owned some property in Cottam, including a house and a farm called 'The Tag' doed about 1840. He published an edition of the Bible, also a paraphrase of the Psalms." The fine timbered Ancestral home of the Haydock family, Cottam Hall was demolished around 1860. Henry de Haydock was a member of parliament for Preston in 1330 and was no doubt one of the Cottam Haydocks. One of this family was William Haydock one of the monks of Whalley Abbey, who was convicted of high treason (for partaking in The Pilgrimage of Grace) in 1537, being executed in a field near the Abbey on the 13th march in the same year. Fulwood Fulwood referred to as Fulewde in 1199 was located at a major crossroad in Roman Times on the intersection between the Kirkham to Ribchester (Watling St Road) and the Walton-le-Dale to Lancaster roads. During this time Fulwood like most of the North West was covered in forest. The forest later became part of the estate of Roger de Poitou. In 1199 a Royal Charter granted the burgesses of Preston the right to fell the timber and settle the land and did so to such an extent that by the 17th century little woodland was left. 138 acres of Land? was retained by the Crown later to be developed as Fulwood Barracks. Goosnargh Goosnargh derives its name from an Old Irish word 'Gosan or Gusan' an Irish name & therefore means 'Gosan's or Gusan's hill pasture', the first recorded use of the name was in the Domesday Book of 1086 when it was refered to as 'Gusansarghe' but by 1212 was described as 'Gosenarghe' much like today's pronunciation. 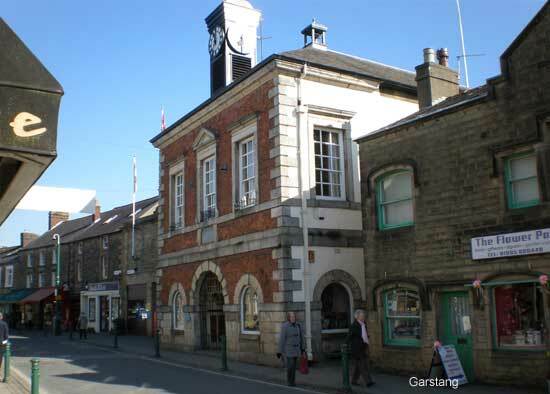 Situated to the north east of Preston, visitors can purchase the local fayre of Goosnargh Cakes. In the village is the late medieval Church of St Mary's in which can be found a well preserved register dating back to the early 1600's. In the 11th century St. Mary's was a chapel of ease, only becoming a parish in 1846. Legend says that the church was planned to be erected on another site, but the fairies kept moving the materials to its present location. Grimsargh Once a little hamlet half-way between Preston and Longridge, Grimsargh is now a sizeable village. Historically, it has always been ?passed through' en route to somewhere else, but it is thought that a Norseman named Grim claimed a tract of land (or ?argh') and settled here. Much later Cromwell and his armies probably passed through after his victory at Preston in 1648. In the next century, skirmishes in the area were between the Catholic Jacobites and Protestant supporters of the new Hanoverian King. Perhaps these armies marched past the newly built farmhouses, Wood Top with a 1724 date stone and Grimsargh Hall built just a year or two later. Haighton Called Halctun in the Domesday Book. Inglewhite Inglewhite lies two miles south of Beacon Fell Country Park. Cottages and the local village pub surround the market cross dating from 1500, on the shaft can be found the initials HCIW dated 1675, believed to be those of Justice Warren, who was at that time the Lord of the Manor. The village green, was once the site of cattle and sheep fairs which were stopped in the 19th century, by a vicar opposed to the practice of bull baiting. Roads leading into the village have the quaint sounding names such as Button Street suggesting the making of buttons, Silk Mill Lane and Trotter Street were horses were trotted prior to sale. The Congregational Church which is situated of silk mill lane was built in 1826. Silk Mill Lane derives its name from a bygone silk mill powered by a waterwheel adjacent to where the brook crosses the Lane. Barring a few stones, a boggy piece of land is all that stands testament to once popular St Mary's well stones. Peddlers cafe was once a smithy, made ammunition boxes during the 1st World War closing around 1992. The car park opposite the church was once common land complete with pond and ducking stool. In the wood yard once stood the Workhouse. Two more pubs once existed in the village namely the Queens Arms and The Black Bull. Lea The name Lea is taken from the Old English word 'l?h' meaning 'a clearing in the wood' the first recorded use of the name was in the Domesday Book of 1086. 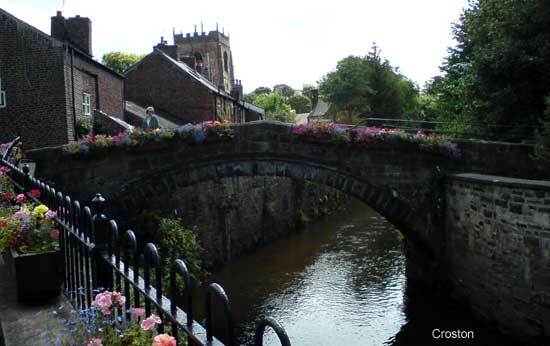 Lea (pronounced Lee-ah) is four miles west of Preston and north of the river Ribble. Today there is little material evidence of the historical association of this part of the rural district but it is interesting to note that Lea with the present day spelling was mentioned in the Domesday Book. In ancient times the district of Lea was divided into two hamlets called French Lea (presumed to be through the Norman settlers) and English Lea, the estates of the de Hoghton's both divided by the Savick Brook. Preston 'Once every Preston Guild,' has become an everyday phrase to describe something that does not happen too often. This is because the Guild celebrations take place in the town only once every 20 years. Since Henry II granted the right in 1328, the Guild Court has been held here. Members of the Guild committed themselves to a high standard of integrity in work and business. If they did not maintain standards of work and honesty, they had their membership cancelled. Whittingham Cows' ribs are very prominent in the village. At Old Rib Farm, built in 1612 on Halfpenny Lane, a rib is to be found over the doorway. The story goes that an old dun cow which grazed the moors was the only one in the locality still producing milk at the time of a severe drought. A witch milked her dry through a sieve and the cow died. The skeleton was preserved and one of the ribs was placed over the doorway of the farm as a memorial of the event. The rib was once removed and hidden in Charnley Brook, however the thief experienced so many disasters he returned the rib to its original location. Halfpenny Lane is so called because it was the old toll road and that was the price incurred by those who travelled along it. It is found north of the main road, on the western edge of Longridge. Woodplumpton Woodplumpton situated to the west of the A6 approx. five miles north west of Preston, derives its name from the Old English words 'wudu' & 'Plumton' meaning ''Plumpton in the wood', the first recorded use of the name was in the Domesday Book of 1086 when it was refered to as 'Plunton' however by 1256 this had become' Plumpton' the second part of the name is thought to refer to a 'a plum tree town' from the words 'plum tree' & 'tun'. The township of Plumpton contained the hamlets of Woodplumpton, Catforth, Eaves and Bartell, all of which were in the manor of Woodplumpton.? The manor was held by the barons of Stockport one of whom married an heiress of the Gernet family. Robert de Stokeport who died in 1248-9 left a daughter and heiress Joan who firstly married Nicholas de Eton and secondly John de Arderne. By her first husband Joan had a son Robert, to whom the second husband released all his rights in the manors of Plumpton and Formby in 1340. Mr. Watson says, "Nicholas de Eton, by the name and description of Nicholas de Eton eldest son of Joan, daughter and heiress of Sir Richard de Stokeport transferee to Margaret de Arderne the manor of Wood Plumpton, which Joan his mother had granted to the said Margery, daughter of Sir John Arderne. Cicely, sister of Robert de Stokeport, heiress of the Etons (who were surnamed Stokeport) conveyed Wood Plumton, together with other estates, by marraige to Sir Edward Warren of Poynton. The estates continued in this line until Elizabeth Harriet, only daughter of Sir George Warren, transferred the manor by marraige on the 26th April 1777 to Thomas Bulkeley, Viscount Bulkeley. The Fleming-Leycesters succeeded to the possesions of the Bulkeleys, and subsequently Lord de Tabley later became the lord of Wood Plumpton. Later C Birley of Bartle Hall became lord of the manor. The Chapel at Woodplumpton is said to have been re-erected in 1630, and the date 1639 is cut upon the timbers of the roof. The oak communion table bears the date 1635 however the register commenced in May 1603. In the north aisle is a monument of white marble, representing a sailor leaning in a mournful pose upon a pillar, under which is an inscription dedicated to the memory of Henry Foster, R.N., F.R.S., who was accidentally drowned in the river Chargres, on the Gulf of Mexico, on the 8th of February 1831 aged 34.? Lostock Hall in South Ribble was a small farming community that became a significant part of the Lancashire & Yorkshire Railway and had several cotton mills.